Fishing at your door! Creek Bend Escape_Dog Friendly_Fishing Creek_Enchanted Mountain Retreats Creek Bend Escape_Dog Friendly_Fishing Creek_Enchanted Mountain Retreats Has all you need to connect with nature, relax and rejuvenate with the sounds of the flowing river, fireplace in the living room, fire pit in the yard, gas grill and hot tub! Has all you need to connect with nature, relax and rejuvenate with the sounds of the flowing river, fireplace in the living room, fire pit in the yard, gas grill and hot tub! CREEK BEND ESCAPE is a river front property, cozy 2 bedroom, 2.5 bath cabin on Fightingtown Creek and only 15 min. to the Ocoee Whitewater Center. This vacation cabin rental sits on about an acre of level ground which is great for the kids, either the 2-legged or 4-legged kind. There is also an outdoor deck overlooking the creek and access to the water. The main level has an open living area with a couch, gas log fireplace and flat-screen TV. There is seating for 6 people in the dining area and the cute galley kitchen has granite counter tops and everything you need. The master bedroom features queen accommodations, full bath and access to the covered porch. The loft bedroom it is accessed by a spiral staircase (please keep that in mind) and features 2 queen beds, bathroom with shower only, large closet and a private deck overlooking the creek. There is a covered porch that runs the width of the cabin and leads to the hot tub, deck and the stairs leading down to the creek which is perfect for fishing, tubing and swimming. CREEK BEND ESCAPE is a pet friendly rental. 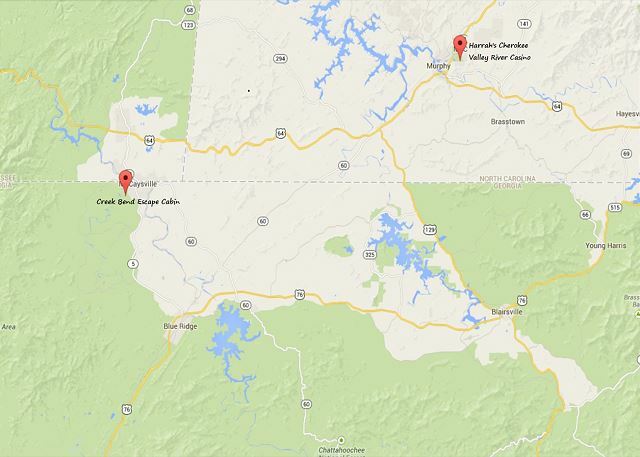 So load up the family, bring the fishing poles and come enjoy some quality time at CREEK BEND ESCAPE for an amazing family travel to North Georgia. The location was very nice and the fishing was good. The drive in was remote and I recommend coming to the cabin for the first time in the daylight as most GPS will not work. The cabin was very cabin-y which was fine for us but if you are looking for a great kitchen full of matching silverware, pots/pans, cutting boards and the like, then you want to choose differently. The upkeep could have been better in that there were many light fixture that didn't work or that were missing bulbs and the showers were a bit of a struggle. The cabin was not very clean on the surface, it likely hadn't been opened up for some time. The cabin had not been swept, and there was laundry in the machines. The hot tub was nice and clean with good chemical used. We appreciate your input, we can assure you we are immediately taking care of the situation to have a remedy ASAP calling the attention to the cleaning crew. We hope we will see you back very soon and enjoy your enhanced vacation. Thanking you again for staying with us. Nice remote getaway, room for dogs to run, very thoughtful to include welcome basket and to especially include dog treats! Thanking you for your comments, we are happy to hear that your vacation was perfect, including for your dog. We will wait for your next stay. Nice town between Blue Ridge, GA and Copperhill, TN. Cabin was clean, as described. Large front yard for our mutts to play fetch. Perfect chilly fall weather. Would have liked to use the fireplace, but it wasn't working. Enjoyed downtown Copperhill. Got to see Ty Herndon in downtown Blue Ridge at Mercier Orchards downtown. That was a great show at the perfect venue, highlight of the trip!!! Thank you for sharing your experience. The fireplace is working fine, we left the pilot on and ready to be turn on. Hope to see you back soon. We had a great time. The cabin was exactly as described. The kitchen was very well stocked with pans, plates, anything you would need. All you need to bring are clothes and food. It was a pleasure having you with us and hope to see you back very soon. We enjoyed our three night stay with our dog. Dog bowls are provided and even dog treats in the gift basket. McCaysville is an extremely small town. Stock up on food at the Walmart in Blue Ridge as the IGA in McCaysville is very small. Avoid eating at Katz Deli in downtown McCaysville, 34 dollars for two sandwiches which were inedible. Extremely overpriced. The cabin itself is small, the upstairs bedroom has an extremely small metal staircase. Once you come down for the day don’t plan on going back up till bedtime. If you have fur babies, they can not go up the stairs. You would have to carry them up and it would be nearly impossible as you need both hands to pull yourself up. Shower heads were only working on three holes so it was painful, we actually took off the head. Still all in all, if you want privacy and relaxation for two maybe four people it was nice. Thank you for sharing your experience. We will change the shower head, sometimes the water residue blocks the flow even though we clean them regularly, sorry for that. This is a wonderful cabin with so much to offer for a perfect vacation. We rented this space to celebrate getting married and thoroughly enjoyed how peaceful and rural the area was. We also enjoyed visiting Tennessee and Blue Ridge! It was really the best of both worlds, an escape as well as really close to plenty of fun and exciting activities! Thanking you for sharing your enjoyable getaway and Congratulations for marriage, we hope you comeback year after year with us. I went there with my 3 sons (15,15,5) for father sons bonding time and fishing. Had a great time, caught 10 trout up to 16". Satellite worked great to catch Braves game. Place was clean, nice, good AC. Was remote to avoid distractions. Hot tub did not work but we did not care. Internet did not work, and cell phones did not have reception but that made it even nicer. Overall we had a wonderful time in the cabin. Being able to go fishing off the back deck was a huge plus. The kitchen was well stocked with pots and pans, the grill outside worked well, and the hot tub was great to relax in. The only caution for anyone booking the cabin in the future would be the staircase up to the second floor. It is an extremely narrow spiral staircase. It was a challenge for the adults in our party going up and down. You have to unpack your suitcase downstairs and pass your clothing up to the person at the top. Thanking you much for sharing your experience. Hope to see you soon. Hope you have a wonderful stay and enjoy fishing. See you back soon. Thank you for staying with us. We have rented 4 times from your company, this was our favorite cabin! Cabin was ready for us, music and lights on. This was appreciated since we were late arriving. We really enjoyed the deck, listening to the creek, the hot tub and bumper pool table. It was private but a short drive to the main road. There were several restaurants nearby. We plan on returning to this cabin. We love having you with us over and over thru the years and so glad you always enjoy your stay with us. We will be waiting for your next vacation and please don’t forget to call us directly to make your booking and apply your Frequent Guests Discounts. We stayed a week at this peaceful cabin. It had everything we needed - someone had even put up a Christmas tree for us, which was a lovely touch. The kitchen is well stocked with everything you'd need to cook with; or there's a grill outside. The hot tub was great. The cabin is in a beautiful location - the driveway can be a challenge and the directions on how to find the property only makes sense in retrospect. Hint: do not turn right on Brookhaven Lane across from Bice Ln.Instead, go straight ahead on Brookhaven (you'll pass a caravan on your right) and continue until it connects with Creek Bend Rd. Turn left on Creek Bend Rd and the driveway is immediately on your left. Our only complaint about the cabin is the mattresses - old and saggy and not very comfortable. Thank you much for your comments, we will be sure the property owners take notice of your input, actually they already are taking action to fix the mattress and box. Hope we will see you back soon. Awesome place to stay! The only thing that could have made it better would have been a better mattress in the master bedroom. Otherwise everything was perfect!! Thanking you for your comments and we will be sure the property owners hear your advice. Hope you will come back very soon for another great vacation. This is a really nice place the location is excellent, quiet right on the water. Plenty of room and fully stocked with pots/pans, utensils/silverware and plates/glasses/mugs. The road in is a little sketchy about one car width wide and several sections with deep gullies along side, doable but if it really rains could be tougher. The area is beautiful but the neighbor's private property signs facing the house do distract some. The gas grill needs new insides or to be replaced. The insides are all rusted out and although it will light it really isnt very safe. The aluminum foil on the grill top impedes air flow so the grill will go out and that could really cause a problem if one is not watching the grill. You can fish out back but the neighbors really have a lot of private property signs all over the creek if you wade you will have to go in and out at the cabin, the water was about knee to waist deep with a current so walking up stream is work. We really enjoyed this place overall and would go back. Thanking you much for your input and hope you enjoyed your stay as we enjoyed having you with us. We will be working on the grill replacement immediately. Thanking you again for your kindness and we will see you back soon. It was great. Thankfully extra nights were available to book before and after our expected dates. We had to evacuate from Hurricane Irma and Anna was so nice and accommodating. Loved the views, weather, and accommodations. We know how difficult the situation was, we are so happy we have the opportunity to assist you and your family. Hope you come back very soon. Our family of 6 had a great time at Creek Bend Escape! The property was clean and spacious. 3 of our children, ages 2-6, would have had enough fun on the vacation even if we had never left the cabin. They enjoyed the loft bedroom and thought the spiral staircase was fantastic. The baby had a good time, too. The family enjoyed the back porch rocker, swing and deck overlooking the creek. The large front yard was a hit with the children and the dogs. During our stay, we spent several days at Horseshoe Bend Park nearby. Everyone agreed that it was a great vacation. Check in and check out were very simple. The reservation process was easy. Ana was pleasant and answered all of my questions thoroughly. We highly recommend Enchanted Mountain Retreats and the Creek Bend Escape! What wonderful comments of your family vacation experience. We do appreciate your biz and hope to see you back very soon for another opportunity to create dear memories with us. This was the perfect spot to celebrate Father's Day Weekend! We brought our two boys and two pups to this cabin paradise! This cabin is located directly on the river. Our boys both caught beautiful Rainbow Trout! The pics of the outside of the cabin does not do it justice! it is BEAUTIFUL!!! The interior is cozy yet really large! The upstairs bedroom is perfect for the kiddos! 3 bathrooms??!! WOW! I am so thankful that I stumbled across this gem! I would love to bring my family back in the future! It’s so fantastic to hear your AWESOME experience with us. Please come back very soon for another enhanced family vacation in the mountains. My family and I had a wonderful time. The cabin was perfect for our family of 4, with the added plus of bringing our dog. Wish we had caught some more fish, but we will be back next year to try again. It’s fabulous that we are going to be your choice for your next vacation. We can wait to have you back! Thanking you for your kindness and see you soon. Overall the cabin was great. We really enjoyed the deck. I would definitely recommend this cabin if you're looking for a quiet getaway. -Water pressure at just the kitchen sink was sometimes virtually non-existent. -The grill is in dire need of replacement. -Need specific instructions on the operation of the hot tub. -There's a sign at the top of the driveway that indicates left turn only, but if you turn left it's a dead end road with nowhere to turn around (I got the evil eye from when I turned around in somebody's yard). We are so glad you enjoyed your family vacation. The water issue in the sink was nothing more than sediment, we cleaned the net of the faucet and the problem was solved immediately. The hot tub it was prepared and ready for your arrival, you needed to jump into the hot tub, push the jets button and enjoy it, no further instructions are required. We have the sign on the top of the driveway to turn to the left to make a U turn and make it easier to drive straight up the gravel road; some people find challenge to make a right turn onto the gravel road uphill. We hope you will come back very soon for another wonderful experience in the mountains. It was a pleasure having you with us and is great to hear about your experience, Thank you for your kindness and hope to see you back soon. What can be better than share time with family and friends in the mountains next to a fishing creek. We will be waiting for your next vacation. Stayed here for two nights, did a mountain bike race at the nearby Ocoee Whitewater Center. Cabin was generally fine, but the AC unit is not nearly strong enough. The cabin wouldn't really cool down day or night. We are so glad you have a great time during your vacation. Thanking you for staying with us and we will be waiting for your next stay with us. We just love AWESOME guests like you, such a positive attitude, ready to enjoy the mountains and deal with the minor details. We were so glad to have you and definitely hope to have you back very soon. Thanking you for sharing your experience and how a happy and positive person can live life to the full extend. We loved this private cabin. The home was extremely well equipped with everything that you would need. It is very conveniently located to the Occoee River which was perfect for us and close to downtown McCaysville restaurant and grocery. We have stayed in the area a few times and this is certainly our new favorite spot. Being on the river is second to none. Thank you very much for your comments, we certainly enjoyed having you with us and we will be ready for your next stay. We were more than satisfied when we stayed at Creek Bend Escape. I had packed extra towels, dog bowls, etc.. But we didn't need them. They had provided more than what was expected. We also called to see if we could check out an hour later and Ana was so very nice and accommodating. We will definitely plan another trip up there. We stayed at the cabin amd just relaxed and fished. It’s always great to have you with us and we thank you for the opportunity to make your vacation special and memorable. Hope to see you back very soon. Cabin is located in very nice location. Clean cabin. Equipped with all items you ever wanted. However there are multiple things that need to be corrected, cause it is not a cheap vacation rental place. First of all both bathroom water pressaure (water flowing what ever you call it) need to be increased. When taking a shower, water flows very poorly. Literally almost like dripping. Next, please provide enough supplies. Looks like owner provided very limited amount of supplies. Not even a full roll of toilet paper was found in entire cabin. 3 or 4 partially used paper towel rolls were kept in all 3 bathrooms. There was only ONE laundry detergent capsule. If guests need to use the washer more than once in their stay, then they would have to purchase laundry detergent. Same with dish washing liquid. No trash bags found. There are no curtains in upstairs. It is true that no one can see you, but there are people who would like complete dark when sleeping or you might want to sleep a bit longer. Creek area in the back seems very foresty. It would be nice if they clean up the brushes . Photos on the website looks clean and welcoming, but reality, back yard area is very Much like a jungle and full of mosquitos. I am sure if they clean it up, it would be more peasant. Thanking you for sharing your comments and we like kindly to address a couple of situations that unfortunately are out of our control, one and most important is the water pressure in the property sometimes is inadequate when used constant in high amounts the property well slows down the flow of water, we suggest to our guests to take short showers or space the time in between people using the bathrooms for more appropriate water flow. In regards the supplies, is clear established in the Rental Agreement that as a courtesy we provide with a setup of supplies such as paper towels, toilet paper in each bathroom, hands and shower bar soaps per bathroom, garbage bag in each can and garbage liner in each outdoor garbage can, a couple of pods for laundry and dishwasher, etc. basic package for your comfort during your arrival, however, is part of your responsibility to acquire enough supplies along with your groceries for your stay. We hope that when you sign the Rental Agreement also you read it to be informed of the principals during your stay. Remember that each cabin is own by independent and private people, each owner decorate their homes to their own style and desire and they open the doors of their home for your enjoyment and in this case the property owners prefer not to have blinds in their cabin to enjoy nature at all times. Is not wonderful, the area is so peaceful and nature brings harmony and peace. This is one of the most magnificent places to relax and reconnect. The cabin was clean, comfortable and spacious. Most of our time was well spent out on the relaxing decks or around the bumper pool table. The spiral stairway to the upstairs bedroom was tight but no big issue. Overall a great location to getaway from daily grind and kick back. It was great having you with us for your vacation, hope to have you back soon and enjoy The North Georgia Mountains. Thanking you again for staying with us. As always, we love to have you back now and so many times! Thanking you much for your loyalty; know that we really enjoy having you with us. See you soon for another fantastic deserved vacation!! The Bend Creek property was in good shape, clean and the property is right on the river. The property manager, who we called at the last minute was extremely helpful and pleasant, she even called to check on us because it had snowed. The cabin could have used some window treatments, felt like being in a fish bowl. We were so happy to have you with us, specially is such short notice under snow showers, but all worked well and your satisfaction is what is more important of all. rained the entire length or our stay. however the cabin was great. very clean. everything was in working order. great time was had. We are proud of having you with us and for the opportunity to enhance your vacation. We will be waiting for your next stay with us. We had an amazing weekend, but there was some hiccups: bathroom light in the hallway wouldn't turn on, couldn't change the setting on the fire place, had no remote for the tv, the garbage disposal didn't work(smelled also),hot tub was outdated, you need four wheel drive for the drive way, and there was little privacy with not have blinds. Beautiful view and a cozy little get away. Sweet little gift basket- so thoughtful. Very accommodating. Wish we would've brought the whole family they would've had a blast especially the kids! We thank you for your comments, although we need to make some remarks in regards to the fireplace is a brand new one and the instructions are simple just to turn the knob from 1-2-3-4-5 and it is working in perfect order. We did receive your call asking for help to turn the TV on and change channels; we always leave TV set on when we prep the cabins for arrival, first to welcome our guests with nice soothing music and to double check the functionality; there are 3 remote controls anyway as we confirm with you, anyway if you couldn’t use the remote control you push the button on the receiver or TV, as you did, however, the 3 remote controls still in there for regular use. We do not understand your comments about the hot tub; it is large and nice in perfect working condition. We do not use blinds because is no need, there is no other property or neighbor who can disturb anybody thru the windows; also you have the opportunity to enjoy the views. We had a great time. It was very relaxing. We enjoyed the hot tub and watching the creek go by. We didn't expect the next door neighbors house to be so close but they weren't home so it still felt very private. The rental company was very friendly, professional, and responsive. (We had a problem with the fireplace but they worked very hard and put in extra effort to have it fixed on the first day.) We hope to return one day. Thank you for your remarks, we hope to have you back very soon! Loved the property, very secluded. We had a great time. The kids did not want to leave. The management (Ana) was very helpful and took care of any issues we had right away. I am very pleased and will probably be calling them soon for our next stay. Thanking you for your kind words. We enjoyed having you with us and hope to have you back soon! Thanking you for your kindness and comments we enjoy the fact that your vacation was fantastic! Come back soon!! Is always a pleasure to have you with us and we hope to see you back soon. Unfortunately the tide curve to get into the driveway is challenging, we ask our guests to use the 2nd driveway for an easier in and out, we are working on fixing the situation and we apologize for any inconvenience. Thanking you for your comments. Thank you very much for your comments; we are taking immediate care of the toilet issue. Thanks again and we will see you soon! Thanking you for your input and always eager to have you back very soon ! The cabin was great. It was clean & decorated well. Had all we needed. Only minus was the gas fireplace did not work. Kind of a "biggie" in Dec. Also, as mentioned previously, the entrance roads were pretty "rustic". If it had rained or snowed we probably would not have been able to drive on them. A 4 wheel drive may have been necessary. Good location- 20 min out of Blue Ridge. I would only recommend this particular cabin March-Nov. Ice or snow would make roads inaccessible. Thank you very much for your comments; we are happy you enjoyed your vacation. Gravel roads can be tough to drive in difficult weather conditions and we will continue working in the maintenance, but it is a permanent work. Hope we will have you back soon! The cabin was in great shape. The spiral stairs to the 2nd bedroom, was narrow but manageable. LOCATION was AWESOME!! There was a rush of trout each morning around 8:20 that moved through for 20-30 minutes. Beautiful to watch...2 were caught and released (big rainbow and speckled). I will be coming back for more of that action. Great areas to hike in the area. The drive in to the cabin area was rougher than expected, a high clearance vehicle would be best. Banged up the bottom of the van and the 2nd car! Thank you very much for your comments, we always appreciate them and to know you really enjoyed your stay, specially the fishing part, that is awesome! Our apologies for the inconvenience of the gravel roads, we know at this time of the year we experience a bit of rough ride, we will work with the property owners to fix the situation. Hope we will see you very soon! My family and I had a wonderful time. It was absolutely beautiful and we had everything we needed at the cabin. It was very special to spend quality time with my family and this was the perfect place to do so. We are so glad you have the chance to enjoy your vacation with your family, the most important part of life. Please come back soon! Loved everything about our stay. Only thing we didn't like was the spiral staircase. My dog would not come up them and I could barely get up them myself and was even harder with luggage. Other than that, LOVED the place. We are so happy to hear from you and even though is not much we can do about the staircase we love to know you enjoyed your stay and we will see you very soon. Wonderful Week on the Creek! Three adults and 2 dogs had a relaxing time at Creek Bend Escape. Overall property was good, but not excellent, but for price and style of vacation it is very good. As mentioned in other reviews, grill is sub-par, but serviceable. A few little things in the kitchen were annoying - need more appropriate wine glasses, knobs on cabinets are not good. Main complaint is TV. While not there to watch TV, we did have a few shows on regular channels -- TNT, CBS, ABC, USA, etc. -- that were blocked (I guess due to the TV14 rating, but not sure). In general TV is hard to use and frustrating. If rainy weather sets in, TV is more important. Selection of DVD's and VCR tapes was minimal. Only other suggestion is upkeep of yard. I'm a gardener and hated seeing weeds and vines taking over rhododendron and laurel (e.g. fire pit area) and a a few dead landscape trees and bushes. Important to note this is in the mountains, but in a beautiful small creek valley along with 4-5 other houses/cabins. Only one other cabin of the group was occupied, so we had no real issues. There is plenty of space, just may have been more noise. Driveway (as seen in other reviews) is a gravel driveway and is teep, but was very manageable even with a straight drive Escape. AnnaLuise was very professional and yet personable and helpful from first contact to the day she came to get rid of a small wasps nest that we discovered. Overall, it was very good experience. Thank you for sharing your experience with us. The TV programing situation was resolved immediately now you can enjoy all your favorite programs. Hope to see you all soon! We had a wonderful time. We fished from the deck and caught trout!!!!! Beautiful view sitting on the deck watching the river. Very cozy cute cabin. Thank you for making this an enjoyable time. We are so very to host your stay and hope you come back soon, we’ll be waiting for you! Overall we had a good time at the cabin, our biggest problem was the road going to the cabin was half washed out after a hard rain Saturday the day we arrived.The rain muddied up the creek , in turn this messed the fishing up for a couple of days but did clear up & was able to catch some nice rainbow trout off the dock using wet flies & corn kernels. We were able to see most of the attractions in the area which was close by. A quiet peaceful place. You are right! This season we have been bless with lots of rain and gravel roads sometimes get affected, please accept our apologies for the inconvenience, the good thing about it is the magnificent beauty of the mountains after a nice thunderstorm, the smell of the fresh soil and clear air… nature at its best! The property was a great place to stay. It was secluded but not too far off the beaten path. The front yard was great and the back deck that extended to the creek was the perfect place to spend time. Relax, hot tub, and fish all from the deck. The property management was very helpful in all aspects. There were a couple of small maintenance issues. The cabin seemed in need of a few repairs. There was a tarp on the roof and the main toilet was coming off the ground. The only other thing that was a little annoying was the child lock on the TV. Any program that was rated R or TV-MA was blocked. This was on the normal broadcast channels. Besides a couple little things it was a perfect stay. Thank you. We are so glad you have a great time playing around the creek! Please accept our apologies for the inconvenience you experience during your stay, and I like to address the situation of the toilet seal it was repair immediately, there was no leaking and it was totally usable, as we discussed in the phone, with time the caulking has to be replaced, but if you as our guest wanted the toilet caulking replaced, we just do it for you. In regards to the situation of the roof, the small protection on the ridge is to prevent any problems while the property owners are working on the repairs schedule; we certainly apologize for the inconvenience and we understand that it doesn’t look very attractive, but we are working on the permanent remedy; thanking you for your kindness and understanding. For the programming, I am sure it was just a matter of a mistake to block the children programming, situation that is solved. Thanks again for your comments and we hope that your vacation was enjoyable and relaxing. The cabin was very nice and clean. There was a nice welcome basket upon arrival. There were plenty of towels, dish towels, etc. The property managers went out of their way to make sure it was clean and welcoming. There were towel animals, just like on cruise ships!! I thought that and the welcome basket were very nice touches. We loved having you with us too! And we really hope to have you back very soon. We always try to make you feel at home with all the details that will show you how much we care and appreciate you, thank you for noticing our efforts. Creek Bend Escape was a perfect place to relax by the fire on New Year's Eve and let the congestion of Atlanta wash away. You already know how much we love having you with us and is an honor to serve you during your stay. See you soon! Cute cottage for a quick weekend away! Great! Wish the owners would allow all cable shows to play or provide the password to the rental company for adult guests. Thank you for your input; we are sharing your comments with the property owners. Hope your stay was not diminishing for the TV programing; we want you back soon! Thank you for your input, very valuable for us. The property owners are working with the water situation, the well is not working properly but will be back shortly with full water pressure. Please be safe and comeback soon. This was the perfect place to have time as a family and really relax! We loved the location by the river. We had cocktails there at night and coffee in am. The large picnic table on the back porch was great for eating meals and listening to the peaceful sounds of the river and birds. We used the terrific grill and hot tub every night too! We also enjoyed hanging out on the front porch at sunset to enjoy the big yard and beautiful trees. We played about a hundred games of Bumper Pool since our daughter loved it so much. She also loved having her own cool large bedroom and bath upstairs. The cabin is very nice inside with everything you need. My daughter and I had a race each night to collect the most fireflies. this was fun since we do not have them in Fla. The location was great. We had a picnic and watched rafters go by on the Ocoee. We loved tubing and visiting the quaint town of Blue Ridge. Anna from enchanted Mnt. retreat was so kind and helped us a great deal! We can't wait to go back!! Is so refreshing to hear your detail experience, thank you so very much for sharing and we hope to have you back very soon for another enhance vacation. We had a great stay at Creek Bend Escape in late July. Being by the creek was fantastic and you can't get much better for accessibility to rafting on the Ocoee. I really appreciated the previous comments on the property, which were honest about the few drawbacks and we were prepared (i.e. spiral staircase is pretty steep and the driveway is gravel, the access to the creek is steep). Overall, the house was well-kept, and very clean. Thanks for a great mini-vacation! Is always our pleasure to assist you! BTW, we never edit our guests’ comments; we like to keep it honest! Thank you very much for staying with us and we will be waiting for your next vacation with us. We had a wonderful time. The only issue I had with the cabin was the metal stairs to the bedroom upstairs. It was extremely skinny and felt unsafe plus the dogs couldn't go up those stairs. We wanted to stay in that room because it had a private balcony. Besides that the cabin was perfect. Thank you very much for your comments. Unfortunately there is not much space for a larger stairs, sorry for that. Overall, the experience was a good one. There were two issues that we had on May 24-25, 2013 visit: the spiral staircase is very difficult to climb up and down, especially with bad knees and with luggage. The picture of the river on the website showed a babbling brook that you can play and fish in. However, the river turned out to be very full and fast and without any riverbank to walk on. Our dogs jumped into the river and we almost lost them due to the fast river current. We appreciate your comments and hope you enjoyed your stay. Unfortunately we don’t have any control over the rain and with 50inches more than last year the river change from the normal course. All of us enjoyed our stay! We especially enjoyed the river and the hot tub. We enjoyed having our dogs with us. The only negative was the gas logs in the fireplace would not stay lite and the bumper table was very rickety and the kids couldn't play it. Thank you so very much for your comments; we already took care of the table leg that needed to be adjusted. For the fireplace, if the temperature in the living room is too hot, the thermostat of the fireplace is going to sense it and shutdown as a precaution measure, as I explained in our conversation, however, we are sending the technician to be sure the thermostat is working properly. Thanks again for your stay and we hope you come back soon. 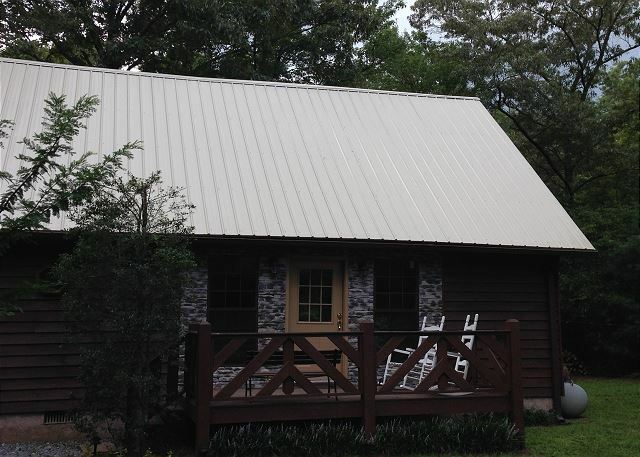 My family stayed at "Creek Bend Escape Cabin" in McCaysville, GA last week and loved it! We've stayed in a lot of different cabins throughout N. GA. since we're looking to purchase our own in the future. This cabin was about 15 mins. from Blue Ridge, GA. (just as stated by EMR Inc.) There was a gift basket awaiting us with a bottle of wine and that really impressed my wife. The creek was literally right out the back door under the deck. The hot tub was large and very well maintained. The cabin was beautiful. If I had one concern (small) it was the gravel driveway you need to turn into to get to the cabin. It was rather steep and loose. We could opt. to use the neighbor's drive but we would have had to drive through both front yards and felt uncomfortsble doing that. Either way we still made it up and down the driveway just fine and had a great time! Thanks again for those directions. They were very accurate and made finding the cabin easy! We are so happy to have you with us and hope you will come back very soon. We promised you to give you an enhance vacation and we are glad we accomplished our commitment. Had an extremely relaxing and great time! We arrived at the cabin to find it clean, cozy and with all the comforts of home. There was great attention to detail in the kitchen and we had everything needed to prepare meals. The Valentine's day gift basket was an especially nice touch and even included some little dog biscuits for our spoiled German Shepherd. We all enjoyed every cozy moment and can't wait to plan a return trip! We are so grateful for staying with us and hope you come back soon. Your pet is part of the family and we are glad he enjoyed the vacation too. We absolutely loved staying in this cabin! The stream that backs up to the house provides the perfect babbling for a relaxing night in the hot tub, or out on the deck. The kitchen is stocked with more tools than my kitchen at home! We didn't need to bring anything but food. Only 4 stars because we were hoping it wouldn't be so far down in the valley. The only mountain views you get are on the drive in. But the stream is beautiful! We are so glad you enjoyed this fantastic cabin with the creek right in your backyard and maybe next time you stay in her sister cabin at Sunset Ledge with an amazing mountain views. Just remember, cabin with water are located down the hill and cabins with astonishing mountain views are in the top of the hill. Hope you comeback very soon and don’t forget to ask for your special discounts! Great Stay. Could use a little more water presure. The loose gravel in the driveway up the hill made getting out difficult in a two wheel drive truck. We apologized for the water pressure and we hope the county will help us very soon with this issue in the area. Also, we know is a little tricky for 10-20ft, but if you are not very comfortable driving in gravel you always can use the second driveway so you don’t need to take a sharp curve you just go straight up. Thank you very much for your comments, we appreciate your stay with us and enjoy again fishing in the creek and the marshmallows in the fire pit. We were impressed that the cabin looked just as it was pictured on the website. The creek was great. It was deeper than I had expected. I spent a few hours fly fishing in the creek and caught two small trout, but I did see bigger ones in the water. The fall leaves were beautiful. The only complaint we had was that the water in the hot tub was really low and looked like it hadn't been maintained. This was disappointing. Overall, we had a good experience and would love to return. Thank you very much for your comments. Although, we empty all our hot tubs after every single departure, we sanitized it and fill it up with fresh water. We never take any chance when talking about health and sanitation for our guests; this is a principle and our strong commitment to our guests. Also, we prep every single cabin right prior to every arrival to ensure all is working conditions and spotless. Regarding this specific hot tub, just prior to your arrival we replaced the cover of the hot tub for a brand new one and also few jets were replaced to be sure the equipment was working in perfect conditions. I can assure you we will double our efforts to enhance your vacation experience for your next stay. We are so glad you have a great time, we will see you soon! The floors were giving in. The beds were very uncomfortable. There were spider webs with eggs on the ceiling and the ceilings were dusty. Prior to every arrival we prep every cabin to be sure all is ready for your vacation. We do our best effort to keep the spiders and spider nets under control, but during this hot season they just keep working faster, please accept our apologies for the inconvenience and we will double our efforts against the natural mountain creatures. Also, we will advise the property owners to help us in our efforts replacing the mattresses. Thanks again for your valuable comments. Last minute trip. Loved the cabin and location. Would return again. Please remember to ask for your VIP discounts on your next reservation. Just the right location close to everything, but we did nit catch any trout on that creek. We loved the cabin but the only drawback id the lack of blinds in the living room. If there were any people around, they could see right the house. We were very happy to have you with us and we appreciate your comments. The good thing about not having blinds is that you can enjoy the view from the living area, dining area and kitchen, also because is a very private location and is extremely unlikely someone is going to be nosing around. As property managers we protect your privacy for you to relax and enjoy your stay free of worries. This is our second time staying at this cabin... we love it here. We had a wonderful time hiking through the woods and listening to the creek rushing outside. It was the perfect location to relax and enjoy family time and nature. I would go back any time. The place and town ,and realty people were Great we will repeat.